The climax of Tarantino’s war-western (and every other genre) sees the film’s many characters and storylines meet up in the one place. 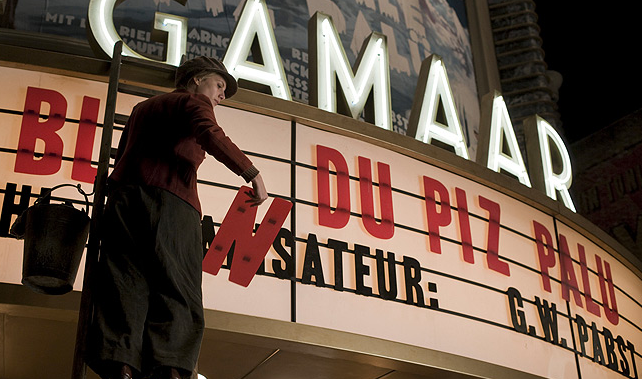 That place is a French cinema, premiering the latest piece of Nazi propaganda, Nation’s Pride. As the film within the film plays, the elite of the Nazi party watch on wide eyed, laughing hysterically at the protagonist, elite sniper Fredrick Zoller, killing countless Allied soldiers. At first it seems like another opportunity for us to be humorously disgusted by a group of people that are often associated with pure evil, but as it continues, a deeper reading suggests Tarantino is mirroring the way in which we also enjoyed the violent killing of soldiers throughout the film – the only difference being that in those instances, it was Nazi soldiers being killed. Before we’re given much time to dwell on this, Tarantino rewards us with more over the top violence for us to enjoy, this time with some very holocaust-like imagery. By asking us to enjoy this while also condemning it, Tarantino could be accused of trying to have it both ways, but somehow he does manage to balance entertainment with a slightly darker subtext. This brilliant scene from John Landis’ An American Werewolf in London is much less a comment on the power of cinema and more a fun and crazy sequence. David, who has recently become a werewolf, is lead into an adult cinema by Jack, his friend who was recently killed by another werewolf. While in the cinema, two of David’s victims from the previous night join them, very angry about having been killed. The three deceased characters, who are all in incredibly graphic make up, proceed to convince David that he must kill himself in order to prevent anymore deaths. The scene is brilliantly absurd, and takes annoying talkers at the movies to another level. In this wonderfully silly set piece, the gremlins have all congregated at the movies for a screening of Snow White. They break out into a raucous sing-along of ‘Heigh Ho’. While this is happening, human characters Billy and Kate prepare and execute an explosion, killing all but one of the gremlins. This is the second scene on the list that ends with the cinema being blown up. Martin Scorsese’s take on cinema’s early beginnings in 1930s France is one of beauty. In one scene, the titular character and his friend, Isabelle, sneak into a screening of Safety Last!. We see cinema’s power for escapism and wonder, particularly for the homeless and orphaned Hugo. Presenting these themes through children is one of the genius aspects of the scene, as the emotions remain simple yet powerful. The Oscar-winning cinematography is also fantastic here, as the light of the projection behind them spills out magically around the children’s faces. Two Scorsese scenes on this list, two wildly different representations of the movie-going experience. Where Hugo presented it as a thing of beauty, Taxi Driver shows a much uglier side as Travis takes his date, Betsy, out to see a movie. The ugly part is that the movie is, as Betsy puts it, ‘a dirty movie’, but Travis reassures her, stating he sees couples there ‘all the time’. Needless to say, Betsy soon storms out of the theatre, leaving in a taxi – unfortunately, not Travis’ taxi. This scene adds greatly to the already disturbing nature of Travis, showing a genuine social ineptitude as well as an all-round grossness. In another creepy date scene, a very short trip to the movies ends before the movie actually starts. While waiting in their seats, Jay and her boyfriend kill time by playing a game in which one person chooses a person in the room, while the other guesses who they chose. This innocent game becomes very unsettling when Jay’s boyfriend points to a girl in a yellow dress whom neither Jay nor we can see. At this early stage, we don’t know exactly what’s going on, but we definitely know that something is wrong. This quiet scene actually proves to be one of the scarier moments of a scary film. This scene in Preston Sturges’ Sullivan’s Travels could be seen as the definitive representation of what cinema can do, or at least what comedy can do. Taking place in a makeshift cinema in a small country church, the imprisoned Sullivan and his fellow inmates sit down to watch a Mickey Mouse cartoon. Up to this point, Sullivan, a successful filmmaker, had been dismissing comedy for a more ‘serious’ type of film in his hopes of being a champion of the poor. But what he learns here, as everyone including himself laugh hysterically at the cartoon, is that the less fortunate don’t need to see their suffering on a screen, but they do need an escape. This view of cinema as something that might change someone’s day rather than their whole world is comforting in its simplicity, despite the sadness that goes with it.